Rembrandt, DaVinci and Van Gogh are just a few of the artists that have used walnut ink in their drawings! Unfortunately their inks were made with real walnuts, which are highly acidic, causing their incredible drawings to fade and the paper to deteriorate over the centuries. 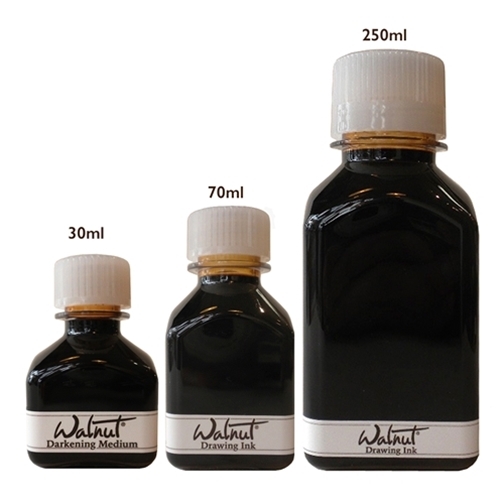 Tom Norton’s Walnut Drawing Ink®is made with artist grade pigments, and it is both lightfast and acid free! You will experience the rich walnut color and superior rendering capabilities loved by the world’s most famous artists knowing that you are using an archival ink. In addition, most brown inks are shellac or acrylic based, which is fine for a myriad of techniques, however they dry permanent. Our ink acts more like a watercolor because it always remains water-soluble. With Tom Norton Walnut Drawing Ink you can layer to darken your tones or add water to lighten them, and you can also use a wet brush to lift color. Tom Norton Walnut Drawing Ink® owes it’s reputation for supreme quality to it’s unique formula which uses premium imported pigment. Experience the unique characteristics and beauty of the ink used by the Old Masters without the acidic qualities of the old formula that fades, is highly acidic and damages paper over time. Tom Norton Walnut Drawing Ink® is extremely lightfast. Tom Norton’s Darkening Medium® is not an ink but an additive to be used to darken the original ink when a drawing needs that extra “punch”. 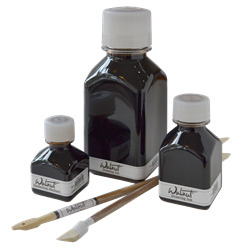 Some artists will add black india ink to darken the color of Walnut Ink. This will work but you will sacrifice the unique watercolor characteristics of the ink and lose the ability to lift color or lighten areas. The Darkening Medium® is very heavily pigmented and made with the same binder as the original so it can be added or mixed with Tom Norton’s Original Ink® without changing its working properties. It can also be used straight from the bottle. However, it is so heavily pigmented it will behave more like a Sumi ink and stain the paper and not lift as easily as the original.